The storm resistant building is constituted of prefabricated steel kept in place by dense rock and landfill so that its centre of gravity is underground making it far less likely to topple over under extreme pressure from storm force winds or collapse from passing typhoons, the gaps in the structure being filled with concrete or reinforced wood. The building may be of any shape provided it is not more than three levels high, and it may also constitute an emergency shelter for communities and be used as an alternative to structures vulnerable to earthquakes in high risk areas. The building is comparatively low cost, and should provide a sense of security to those who are traumatised by fear of damage to themselves and their property. 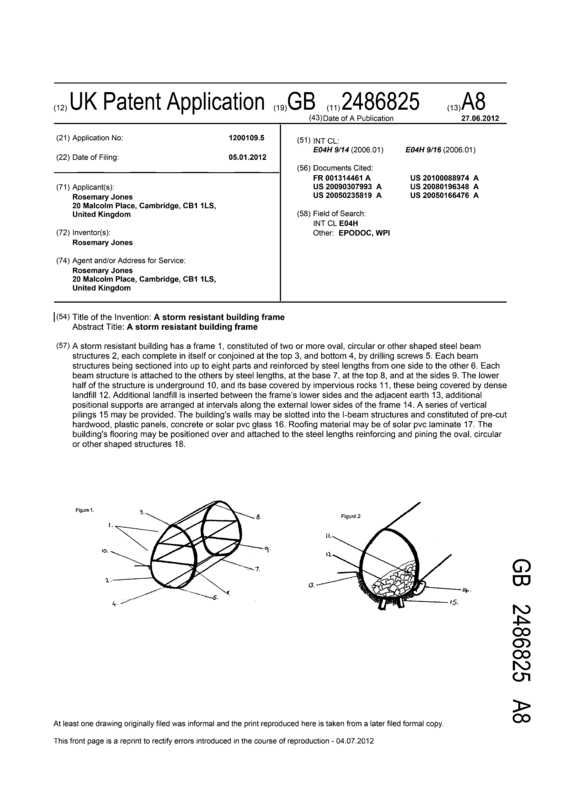 It is also patent application protected in the USA on account of the many instances of storm damage to homes there, and could be included in relief organisations' efforts to rebuild communities or used by councils needing to construct low cost social housing. I am looking to license the patent with royalties, or an outright sale to any person or organization which will ensure its usefulness to poorer people is not prohibited by cost. The invention has not been sold or marketed, partly because it has been waiting validation as to the extent of resistance to wind speeds. The market potential is as great as the numbers of people at risk from storms and typhoons (and most probably earthquakes). As yet there is no website. Page created at 2019-04-25 4:00:05, Patent Auction Time.